There are just as many people saying pocket .380’s perfectly fine for self-defense as there are people saying it’s terrible. As I’ve mentioned before, ANY bullet size is better than no bullets at all. In the end, shot placement > bullet size in every case. 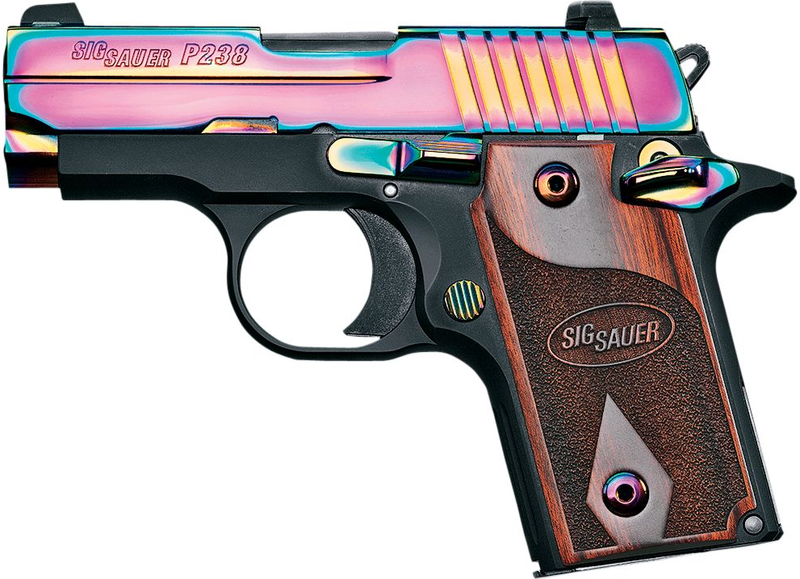 But now it’s time to talk about the Sig Sauer P238. A little company named “Colt” released it a few years ago. A little over 100 years ago to be exact. It shot the big .45 caliber mamma jammas and looked rather pretty while doing it. Colt was like “good idea, Slappy, we’ll get right on it” and released the .380 Government model. It was essentially a scaled down 1911 with all the features removed that were too hard to fit into a smaller gun (like the grip safety and such). As a response to that guy, Colt released a gun called the “Mustang” in 1986. This was an even smaller and lighter pistol than the GM and had even fewer moving parts. This was a popular little gun but, for whatever reason, Colt stopped making it (until recently). There’s this company called SIG Sauer that makes guns. They make good ones, I might add. They bought the rights to the Colt Mustang, made a couple of modifications and released it to the world as the SIG P238. It’s a tiny 1911 that’s chambered in .380 ACP. Like the 1911, it’s a single action, semi-auto pistol with a manual safety and slide release lever. SIG also ships them with their glow in the dark night sights. 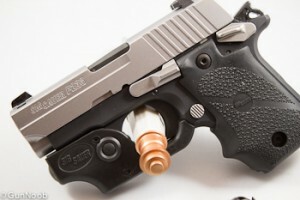 This pistol can fit into pockets easily and, being an all metal gun, feels a bit sturdier than some of the polymer offerings of the P238’s competitors. Even though it’s all metal, there isn’t a noticeable weight gain to it as compared to the other polymer pocket pistols either. The thumb safety is stiff but easily disengaged when you want it off. But that’s not…wait…yes! This is what I’m here to talk about! Let’s get to it! It breaks down similar to a 1911…kind of. Actually, it breaks down almost exactly like my LC9. Move the slide back until a couple of indentations line up, pull out the slide release lever, push the slide forward, pull out the spring and then the barrel. When you reassemble, you have to push the ejector down in order to get the slide back onto the frame. If you don’t, you can destroy the ejector. It’s a little detail but I don’t like the delicateness of that particular step. Otherwise, it’s pretty easy to pull apart. Just freaking be careful. For that little “oops, I just broke my gun” potential, the P238 gets a 4 out of 5. Once you do have it broken down, there’s not much to clean. It’s got a tiny barrel. There isn’t much in the way of surface area to scrub. I was able to scrub it completely spotless in just a couple of minutes. If you do pocket carry, you’ll want to give special attention to the hammer area with some compressed air. You don’t want a massive amount of lint building up there. I like a gun that’s simple to clean. 5 out of 5. Pocket pistols are notoriously finicky. 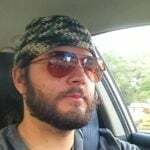 In many cases, there are warnings in manuals about “only use X grain ammo in this gun” or people on forums saying “only use Winchester ammo in a ______ pistol”. This gun, however, was solid. Not a single malfunction with my lovely cheapskate range candy. Face it, when you’re carrying a pocket pistol, you’re carrying it for one reason only: to protect yourself. Anything less than a perfect score in reliability is inexcusable. That being said, this gun gets a 5 out of 5. Keep in mind, this is a tiny 1911. If you’re carrying in Condition 1 (cocked & locked), the hammer is going to be cocked. This might make some people, especially those new to carrying, a bit squeamish. Not to worry, SIG has you covered with a laundry list of safety features. There is a manual safety on this gun. I know there are some that don’t like a manual safety on a carry pistol but as long as you properly train yourself to disengage that safety on the draw it won’t be a problem. 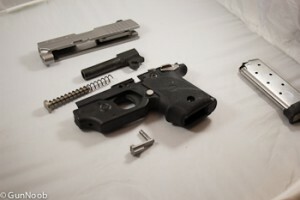 There is also a firing pin safety block, hammer safety, and a disconnector that keeps it from being able to fire if the slide isn’t locked into the correct position. 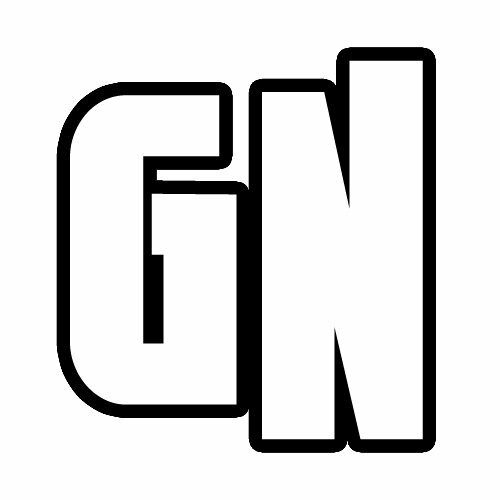 All in all, like most new guns, this thing isn’t going to just “go off”. I mentioned before that pocket pistols are notoriously finicky. They’re also notoriously unforgiving. There are tight tolerances and not much room for error. The slightest limp wrist can cause slide bite or smoke stacks with many of them. I’m happy to say that’s not the case with this gun. Try as I might, I could not get this thing to malfunction. Pocket pistols are also known for being a bit snappy. When you have a very light gun with a very short barrel, the muzzle flip can be surprising. In some cases, it can be almost as bad (if not worse) than larger caliber pistols. The P238, on the other hand, had an amazingly light recoil. If I stop and say “wow” after the first shot, that usually means it’s a winner. The lighter recoil makes this easy to aim and easy to get back on target. It also makes it easier to practice with frequently. I have no complaints in this area. Definitely a 5 out of 5. Oh Siggy, you had a good streak going there. In your kit, you get a plastic case and a single 6 round magazine. In the case of this particular model, it also came with a laser sight. That’s it. Nothing special here. On the bright side, the plastic case is at least decent quality. The problem with pocket pistols is there isn’t much room to play with. There are a variety of laser sights made specifically for this pistol by multiple manufacturers. Extra magazines for it are surprisingly expensive. The grips, however, are removable and there are lots of really cool options in that department. You can put different sights on it also but the ones that come with it are so good, I can’t imagine why you’d want to. This gun was a delight to shoot and carry. So much so that I’m seriously considering trading in my LC9 for one. The LC9 isn’t much bigger but it’s big enough that I can’t pocket carry it in all my pants. I couldn’t find any that the P238 wouldn’t fit into. While I never recommend buying your daily carry as your first and primary pistol, if you’re going to get a tiny gun as your first, you really can’t go wrong here. 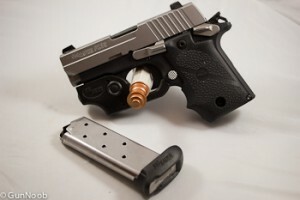 In the end, SIG Sauer’s P238 gets a solid 4 out of 5. Check out our other choices for Best .380 Pistol. Got a SIG P238? Carry a different pocket pistol? Let us know in the comments! still, the SIG is a mini 1911 and it looks and works fantastic. I’ve had mine for about a year. It’s now my primary carry gun. Only malfunctions have been with oddball ammo, like Hornady’s Critical Defense with the conical nose. Remington Golden Sabres run through it like a hot knife through butter. It kicks a little, but falls right back on target. It outshoots my 4.5″ Makarov. Highly recommended. Went to Lgs yesterday to browse, and came across this little p238 with rosewood grips. Never held one before. As soon as I held it, I knew I had to have it. Owner said it was a return and said he shot 2 full boxes through it before he put in the case. Said the guy just didn’t like it. I offered him some $$ and it’s mine now. I love it!!! Sweet little gun. I got it so cheap I almost feel guilty. One shot and you know it’s quality. Got one several years ago and really, really like it. It goes bang EVERY time I pull the trigger no matter what kind of ammo I’m running or how long I’ve carried it since the last cleaning. Most carry guns can be less than satisfying at the range, but this one is pleasant to shoot and quite accurate. Showed it to a neighbor and they got one the very next week. I’ve worn out several pants pockets and all the color is gone from the gun’s edges. Yes, I carry it a lot. Excellent review. This gun was a delight to shoot and carry. Nice, glad you found the one for you! Just purchased a sign p238 today. Took it out of the box and attempted to insert an empty magazine. I could not do it unless I pushed the magazine release down. Most other guns I have had, you could just slide the empty magazine right in. Any thoughts. Hey Patrick, any chance the gun was modified before you got your hands on it? An improperly installed aftermarket mag release could maybe cause that issue. Beyond that, I’d say disassemble the pistol and make sure the takedown lever is all the way clockwise as far as it will go before reassembling, and try again. You should definitely be able to insert a mag without depressing the mag release.